Some jobs or responsibilities carry more weight than others, yet perhaps none is more daunting than completely revising a company's culture. Cathie Kozik, Corporate Vice-President, Integrated Supply Chain IT for Motorola, has only been in her new position for a few months, but already has discovered that she has more than her fair share of work cut out for her. She is accountable for the end-to-end responsibility of all the systems that keep the Motorola supply chain running, and working together with other departments to create a vision for what the future looks like. 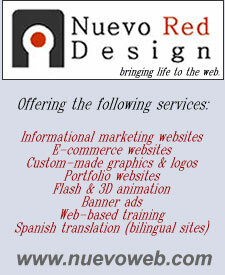 Nuevo Red Design, is the essence of interactive multimedia for the web. The goal of this company is to create a professional web presence, with interactive elements, for our clients' marketing or learning initiatives.